Among the copious amounts of NFL news over the weekend were several key running back moves. Let’s analyze these moves on the field and from a fantasy football perspective. In San Francisco, the 49ers responded to the retirement of Glen Coffee by signing Brian Westbrook as Frank Gore’s backup. Westbrook had a dynamic eight-year career in Philadelphia, producing big numbers as a runner and receiver and proving to be a team-first, smart guy. The problem with Westbrook was his durability. He missed games in every year of his Eagles career, and that durability is one of the reasons the Eagles moved on. Because San Francisco relies on Gore so heavily, Westbrook will have a limited role, and that may enable him to last throughout the season in San Fran. For a 49ers team trying to move into the playoffs again, Westbrook is a worthwhile investment as a role player. Fantasy analysis: Gore remains a top-8 fantasy running back even with Westbrook arriving. Westbrook rates higher than Coffee would have but will be a No. 5 back in most leagues. Westbrook’s arrival makes Anthony Dixon a draft pick only in the largest leagues. In New Orleans, the Saints responded to Lynell Hamilton’s season-ending injury by adding ex-Redskin Ladell Betts as their No. 3 back. Betts spent his first nine years in Washington, and although he was a lead back in just one year, he proved his value as a versatile back who can block and catch in addition to run. He steps in for Hamilton in the role that Mike Bell had last year for New Orleans as Pierre Thomas’ counterpart and short-yardage specialist. Betts may not be the thumper that Bell was, but he’s good enough to allow the Saints to keep Thomas fresh, and that’s all they could hope for with a mid-August replacement. Fantasy analysis: Betts’ addition does not affect the fantasy stock of Thomas or Reggie Bush. Betts becomes a potential No. 5 back in larger leagues. In Houston, the Texans’ offense took a big hit when second-round pick Ben Tate suffered a season-ending ankle injury in the preseason opener. Tate was slated to compete with Arian Foster as the Texans’ featured back, and Houston head coach Gary Kubiak has shown he likes to have a deep stable of running backs. Now that Tate’s out for the year, Houston will need Foster to become an every-down back and Steve Slaton to regain consistency as a third-down back. Tate’s injury is a blow to Houston’s prolific offense, and that offense is the reason the Texans have playoff hopes. Fantasy analysis: Tate’s injury means that Foster is now a clear-cut No. 3 fantasy running back who approaches the top 25 at the position. It also makes Slaton a better bet as a No. 4 fantasy back. It’s possible that another Texans back, such as Chris Henry, could emerge as a sleeper as well, so watch the preseason to see if someone else emerges. In Tennessee, the feel-good story of RB Stafon Johnson took a nasty turn when the undrafted rookie suffered a season-ending ankle injury in the preseason opener. Johnson, a starter at USC who suffered a catastrophic throat injury during a weighlifting session when the bar fell on his throat, was trying to return to the field, but this injury makes the NFL an impossibility this year and even more of an improbability going forward. Johnson deserves better luck. The Titans signed vet Samkon Gado to fill Johnson’s roster spot. Fantasy analysis: Neither Johnson nor Gado had or has fantasy value. 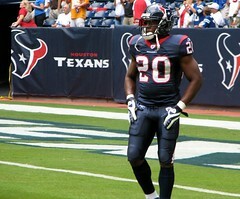 Javon Ringer is the handcuff to Chris Johnson, and LeGarrette Blount is worth a look as a sleeper if he makes the team.